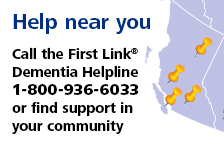 Connections is a newsletter for people affected by and concerned about dementia in B.C. Learn more about the stigma around dementia and linking a community of dementia support. Read a caregiver’s account of dealing with stigma and profiles of our extraordinary volunteers. You’ll also find caregiver tips, information about Alzheimer’s Awareness Month and the upcoming Breakfast to Remember. Insight is a newsletter for people living with dementia. In this issue, we discuss stigma and Alzheimer’s awareness month. Read a personal reflection from on living with the stigma that surrounds dementia as well as a profile on one of our longtime volunteers. You’ll find a story about the new Canadian Charter of Rights for People with Dementia and ideas about how to stay engaged through creativity. Learn more about Alzheimer’s Awareness Month by visiting the campaign website, ilivewithdementia.ca. Consider subscribing to the Society’s newsletters here.